From housing and childcare to cars and household tools, many people are motivated to share resources but don’t know how or where to start. 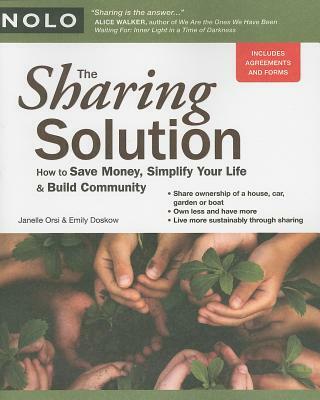 The Sharing Solution is a practical and legal guidebook designed to help people create and maintain successful sharing arrangements while addressing commonly held concerns about liability and individual security. Who can benefit from sharing? Busy parents looking for help with meals or pet care; Retirees who are looking to share needed services; Anyone who wishes to purchase property but can’t afford a singlefamily home; Those who wish to work fewer hours, but need to reduce living expenses; Professionals who work in the field of community economic development; Lowincome residents or those who require or desire a purchase that they cannot singlehandedly afford. And, not least of all, people who are concerned about the environment and wish to find ways to make their lifestyles more sustainable. In fact, statistics tell us that many people belong to this group and that there is enormous interest in the reduction of waste and consumption with fewer tons of solid waste hitting U.S. landfills and greater numbers of people recycling and composting, with 62% of yard waste composted, and a 40% increase in container and packaging recycling in 2007.